Six members of Mexico's military were killed this week after members of the New Generation Jalisco cartel shot down their helicopter with a rocket-propelled grenade. The incident was one of the most brazen attacks in the Mexican government's deadly war against drug trafficking cartels. It's a conflict that has seen multiple gangs rise and fall in prominence, with more than 100,000 lives lost in the process. The New Generation Jalisco cartel is the latest organization to become a formidable power in Mexico's world of crime. Formed in 2010 by the drug trafficker Nemesio Oseguera, aka "El Mencho," the cartel was a breakaway from another group called the Milenio cartel that fractured upon the arrest of its leader. Now they are considered one of the most powerful criminal groups in the country, as other notable cartels like the Zetas have been weakened and had their leaders captured by the state. Last year saw the capture of Joaquin "El Chapo" Guzman, leader of the feared Sinaloa cartel and one of the world's most wanted men. In March 2015, the high-profile leaders of the Zetas cartel and the Knights Templar cartel were also captured by authorities. But as typically happens when any of Mexico's powerful cartels are weakened, another -- in this case, the Jalisco cartel -- has since risen to prominence. The cycle is an outgrowth of what's been called the "kingpin strategy," where authorities concentrate on neutralizing the heads of cartels. The unintended result is often a destabilization of the drug trade's power structures, and the emergence of dangerous new organizations. "Every time you take out the leadership of an organized crime group that creates a power vacuum, that vacuum is filled either by some kind of internal process of competition or selection or through encroachment from outside groups," Dr. David Shirk, director of the Justice in Mexico Project, told The WorldPost. "In the power vacuum that developed after the targeting of the Knights Templar organization, we saw the rise of the New Generation cartel of Jalisco." The kingpin strategy was borne out of similar tactics used by the U.S. Drug Enforcement Agency against Colombian cartels in the 1990s, according to The Atlantic. Shirk told The WorldPost that whether the strategy could be considered "successful" depends on how you're measuring success. "The number of drug cartels with the capacity to corrupt or kill high-level government officials is arguably significantly reduced... [and] the revenue generating capacity of organized crime groups in Mexico has diminished considerably," Shirk said. "However, the trade-off is we've broken up these groups up into smaller regional organizations that are much more violent, much less predictable and arguably a greater threat to citizen security." Shirk said the attempt to capture the leader of the New Generation cartel is what triggered the past week's flare-up in Guadalajara. Besides shooting down the helicopter, the group also set fire to banks and gas stations in the city, reports the Los Angeles Times. Dozens were injured and 15 killed in the violence. 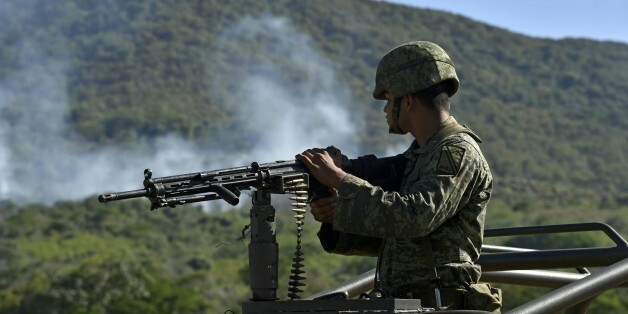 Mexico's military is expected to launch "a full-scale offensive" against the Jalisco cartel in response, according to the LA Times.